There’s a chill in the air and the holidays are just around the corner. That can only mean one thing: Soon we’ll be seeing a jolly man with a sack of gifts coming to your home. Except for one big problem. This man won’t be wearing a red suit and he won’t be there to deliver presents. With the arrival of the holiday shipping season, criminal activity is on the rise, according to Sgt. Aaron Johnson of the Boulder City Police Department. There are, however, solutions to help make sure your holidays remain merry and bright. Johnson said most major shipping companies have fairly accurate tracking systems that can alert you when packages will be delivered. The less time packages remain outside, the less opportunity there is for criminals to take advantage of the situation. “If you don’t give them the opportunity, they’re not going to have it,” Johnson said. He recommends letting delivery people know they are welcome to put parcels behind a gate where they are out of sight. “We’re fortunate here in Boulder City. We’re still a community. Talk to your neighbors,” he said adding that they can accept deliveries for you. 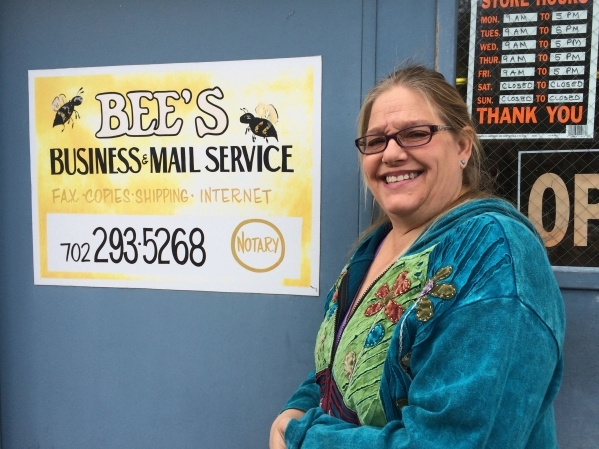 Jeanie Slater of Bee’s Business & Mail Service also is offering to accept packages, at no charge, for Boulder City residents. “They can have their packages delivered here for free so there are not left on the porch all day,” she said. This is the first year Bee’s has offered this service. A six-year member of the Boulder City Chamber of Commerce, Slater said she felt it was time she did something special for her fellow Boulder City residents. “It’s a decent idea and decent of her,” Johnson said of Slater’s offer. Slater said she got the idea after seeing something on a television news program about packages being stolen off front porches. Once packages are delivered to her business at 1400 Colorado St., Suite C, people can come by during regular office hours, 9 a.m. to 5 p.m. Monday through Friday, or call and make special arrangements to pick them up. Johnson said another idea to deter thefts is to requiring a signature before a package can be delivered. Slater said she is happy to sign for her customer’s packages, and already has many delivered at her business on a regular basis. She said she works with all of the shipping companies, including the United States Postal Service. In addition, she said she is offering new customers a 10 percent discount on holiday shipping. For more information about Bee’s, call 702-293-5268 or visit www.beesmailservice.com.